Photo courtesy of the Sun Foundation. 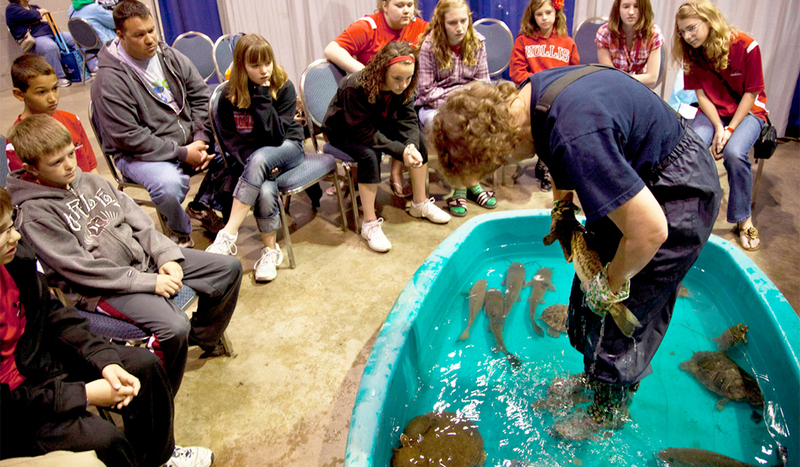 Every spring, The Sun Foundation invites students, teachers, community leaders, and the general public to attend the Clean Water Celebration at the Peoria Civic Center. Through engaging hands-on activities and exhibits, this gathering encourages students and the public to learn how to improve water quality, to think critically and creatively about water conservation issues, and to protect and sustain our natural resources. IISG educators, Terri Hallesy and Kirsten Walker, challenged students to tackle the issue of Asian carp invading new areas through IISG’s “Stop Asian Carp in Their Tracks” activity, a video about Asian carp in Illinois, and the website Nab the Aquatic Invader! Presenters shared information about how this troublesome invader competes with native fish by eating lots of phytoplankton and zooplankton, the base of the food chain. Students learned how carp – which can weigh up to 60 pounds – become startled by boat motors and jump out of the water, smacking nearby boaters and anglers. In small groups, students also discussed the location of Asian carp’s native habitat, how they arrived in the Midwest, and strategies to help reduce their populations. Students gained an understanding about the ways in which invasive species are introduced, the competitive advantages they have in their new ecosystems, and their huge impact on an area’s natural biodiversity. As a result of these activities, students were equipped as agents for change to engage family and community members in understanding how they, too, can play an important role in stopping the spread of aquatic invaders.